Go to original pattern for design DROPS 139-15. 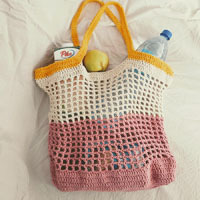 Crochet DROPS bag with granny squares in “Paris”. 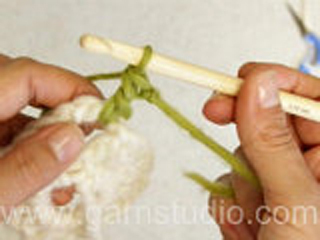 DROPS CROCHET HOOK size 5 mm / H/8 - or size needed to get 1 granny square to measure 12 x 12 cm / 4¾'' x 4¾''. 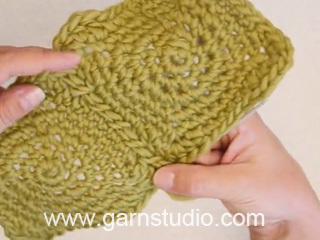 You can get the yarn to make this pattern from	18.00$. Read more. Because we cut the yarn and change the color on every round, work first dc on every round as follows: Make 2 YO on hook, insert hook in last st from previous round, make 1 YO and pull through, make 1 YO and pull through 2 sts, make yet 1 more YO and pull through the last 2 sts. 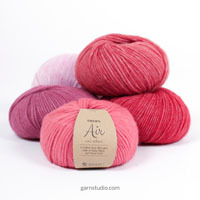 Fasten the yarn end after every color change by letting the strand from previous row be worked into the piece a bit before cutting it off and fastening it (work with the new color around the previous color). After last sc on 1st round, work 1 sc in next sc (= 1st sc from beg of 1st round), then work in the round with 1 sc in every sc. Change color on every round. Color no 1 when beg + 1 round, then color no 2 on 2nd round, color no 3 on 3rd round and finally color no 4 on 4th round. Bag consist of 13 granny squares sewn tog according to fig. M.1. 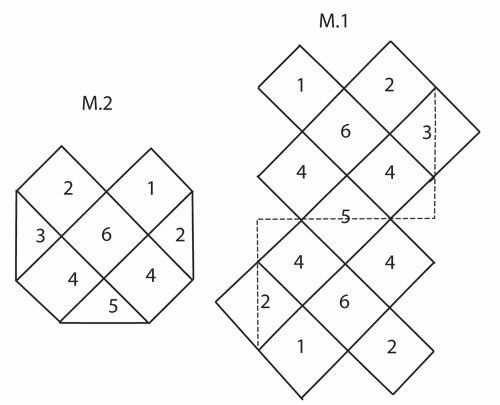 Squares 3 and 5 are worked 1 time, squares 1 and 6 are worked 2 times, square 2 is worked 3 times and square 4 is worked 4 times. 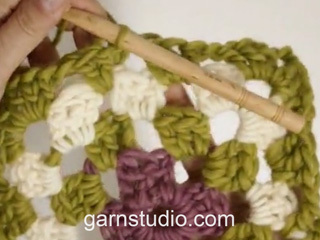 GRANNY SQUARE: Read COLOR OVERVIEW. 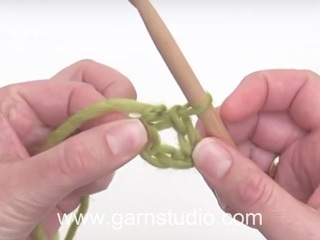 BEGINNING: Ch 6 on hook size 5 mm / H/8 and form a ring with 1 sl st in first ch. ROUND 1: ch 3, 2 dc in ch-ring, * ch 3, 3 dc in ch-ring *, repeat from *-* a total of 3 times and finish with ch 3 and 1 sl st in 3rd ch from beg of round. Cut the yarn and change color. Turn piece. 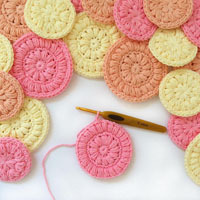 ROUND 2: Read CROCHET TIP 1 and 2. Work 3 dc in first ch-space, ch 3, 3 dc in same ch-space, * ch 1, 3 dc in next ch-space, ch 3, 3 dc in same ch-space *, repeat from *-* a total of 3 times and finish with ch 1 and 1 sl st in first dc in beg of round. Cut the yarn and change color. Turn piece. ROUND 3: Work 3 dc in first ch-space, ch 1, * 3 dc in next ch-space, ch 3, 3 dc in same ch-space, ch 1, 3 dc in next ch-space, 1 ch *, repeat from *-* a total of 3 times, 3 dc in next ch-space, ch 3, 3 dc in same ch-space, 1 ch and finish with 1 sl st in first dc in beg of round. Cut the yarn and change color. Turn piece. ROUND 4: Work 3 dc in first ch-space, ch 1, * 3 dc in next ch-space, ch 3, 3 dc in same ch-space, ch 1, 3 dc in next ch-space, ch 1, 3 dc in next ch-space, 1 ch *, repeat from *-* a total of 3 times, 3 dc in next ch-space, ch 3, 3 dc in same ch-space, 1 ch and finish with 1 sl st in first dc in beg of round. Cut the yarn. Sew squares tog with neat little stitches, follow fig. M.1. Fig. M.2 shows the bag when sewn tog. Worked in the round. Ch 5 with denim blue and form a ring with 1 sl st in 1st ch. Work 1 sc in every ch = 5 sc. Then work SC IN A CIRCLE - Read explanation above- for approx. 180 cm / 70'', fasten off. Thread the shoulder strap through both layers at the upper corner on one side of the bag and through both layers at the upper corner on the other side of bag. Sew ends on shoulder strap tog.